One of the best ways to keep your kitchen from appearing boring and bland is to install a creative backsplash. A backsplash is paneling placed on the wall behind your stove or countertops. 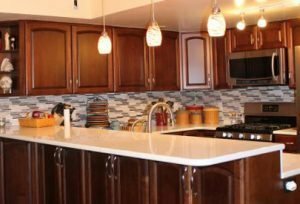 The functional purpose of a backsplash is to protect your wall from splashed liquids, but I think the real purpose of a backsplash is to add a splash of beauty to your kitchen. 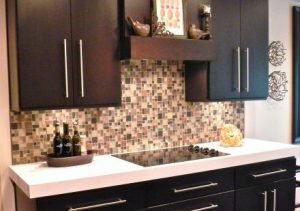 There are so many things you can do to make your backsplash stand out; here are three of our favorites from past projects. 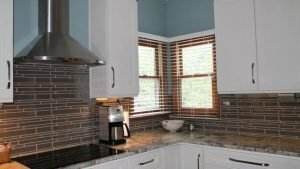 In this recent kitchen project, we used thin tiles in different shades of white, black, and gray to create an irregular pattern. The effect is an eye-catching backsplash that keeps this kitchen modern and interesting. In this kitchen, we took a similar concept and altered it a bit. We varied the size and color of small tiles to create a lovely variegated pattern. The backsplash becomes the perfect accent for this sleek and bold kitchen. Rather than wrapping around the room, we focused on certain areas of the counter space for maximum impact. You don’t need a large counter space to have a stylish backsplash! This is another backsplash we love. Thin and thick horizontal tiles create a bold pattern. The contrast of dark tile and white grout really makes this backsplash special. We love how the effect of the backsplash carries over into the blinds! Varying the color and size of your tiles is just one way to make an interesting backsplash. You can also use tile to create texture. These curved tiles created a textured effect that almost looks woven. Combined with under-cabinet lighting, it creates a lovely look in this kitchen. Adding a unique backsplash to your kitchen is a great way to get the most bang for your buck. Styling this relatively small area of your kitchen makes a big difference when it comes to style. Are you ready to update your backsplash? Come by our studio to talk to our designers and see our tile selection. I think you’ll find something that fits both your budget and your design aesthetic. We’re open 9 a.m. to 5 p.m. Monday through Friday, and Saturdays from 9 a.m. to 1 p.m. We’d love to help you make a splash in your kitchen!